Pizza soup is all the flavors of pizza in a bowl. 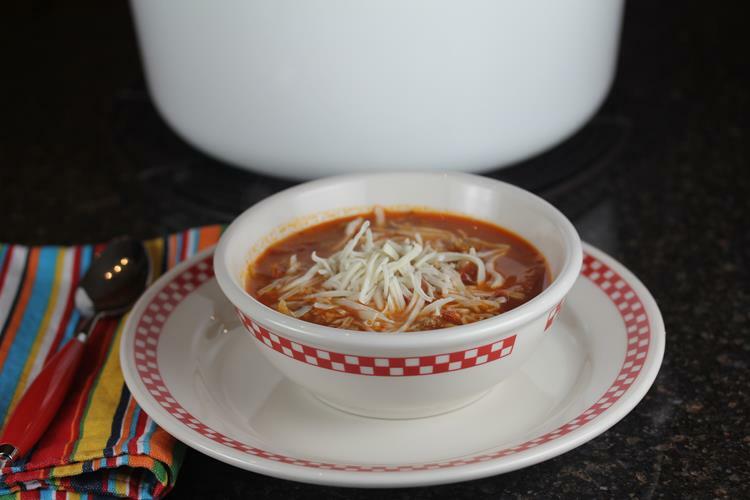 It is a quick and easy soup to make that your family is sure to enjoy! My kids love pizza. And really what kid does not love pizza? Today’s soup recipe is all about the flavors of pizza in a bowl of soup. 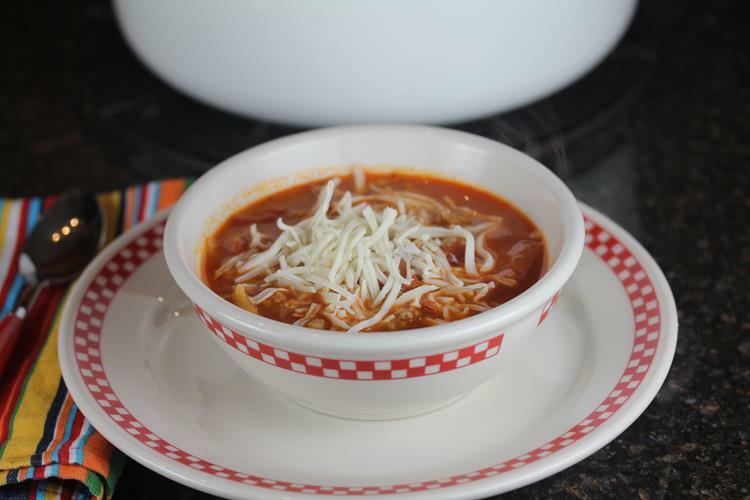 This pizza soup recipe is so easy, so good, and very kid friendly. And you can easily add other ingredients like green pepper, onions, mushrooms, or whatever you like on pizza, to give it the flavors that you enjoy. 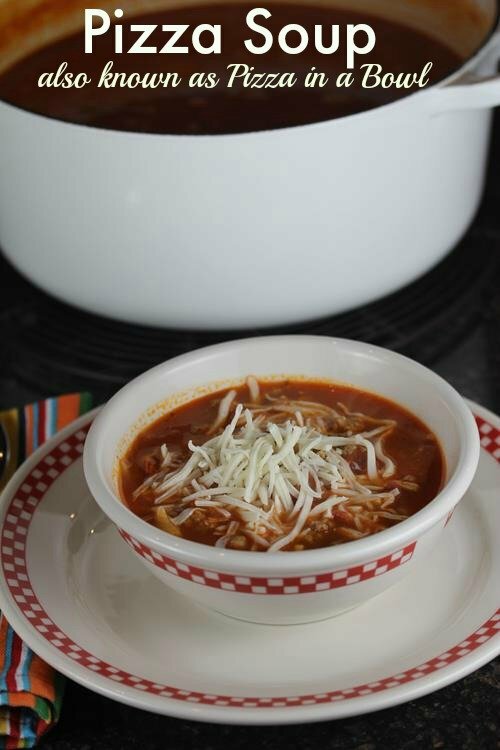 If you have missed out on my other Souper Monday recipes you can find all of them here. In a large pan brown sausage until done. Drain off any fat. Add water, spaghetti sauce, and noodles. Cook over medium to medium high heat for about 12-15 minutes or until pasta is done. Stir in cheese and pepperoni until cheese is melted. How creative! Thanks for the degreasing tip. I am so trying this! Sounds easy and delicious! Thanks for the recipe! Made this tonight and I must say it is delicious. I added bacon bits because I didn’t have any hamburger. So glad you liked it and I am sure bacon would be good in it! I made this “accidentally” several years ago. It started out as goulash, but when I asked my son to add water to the pan next to the goulash pan, he misunderstood and dumped the water in the goulash. My kids named it “Lasagna Soup” and loved it. It’s been a staple at our house since. I’ve never added the pepperoni, but I’ll have to try it next time. Everything’s better with pepperoni! Hi Lynn, I made this and didnt think it was too flavorful. I was wondering, is 9 cups water is what you use? Other people seem to like it so maybe it was just me. Next time I was thinking of using two jars spaghetti sauce. Love your site, and thank you for all the recipes I have tried many. Yes, that is what I use, but you could easily decrease the water in it, or you could use more sauce, either way I think would work fine to increase the tomato flavor in it.